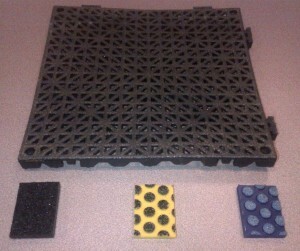 The blue and yellow tiles in the picture, Braxx offers a very strong UHMW substrate punctuated by raised “buttons” coated in either sand (blue) or clean coal slag (yellow). This material makes excellent stair treads or high-visibility safety flooring as it can be cut into the desired shapes, as long as those shapes can be made from 3′ x 9′ sheets. Braxx was originally designed to replace tapes and painted coatings for the U.S. Military. The small black tile in the picture, Redco LUNS is an extremely versatile and premium anti-slip option. Redco LUNS is a reprocessed UHMW that has an integrated clean coal slag surface (the slag is co-cast with the molten UHMW and cannot be separated). Redco LUNS should be used in the most aggressive applications and we can supply customized segments for you, though a minimum order of (2-4) 48″ x 120″ sheets applies. LUNS was also originally designed to replace tapes and painted coatings for the U.S. Military and its first application was a U.S. military tank carrier in 1989. The floor is still in service today! For more information of a quotation on any of these products, please contact us today. *That statistic is an informal average supplied by the manufacturer and is by no means a guarantee.